8.01mm x 8.76mm / 0.315in. x 0.345in. Faith, Hope, and Charity Accent Charm by Rembrandt Charms. The height is 3/8 of an inch. Express your belief in the three great virtues with the Faith, Hope, and Charity Accent Charm. 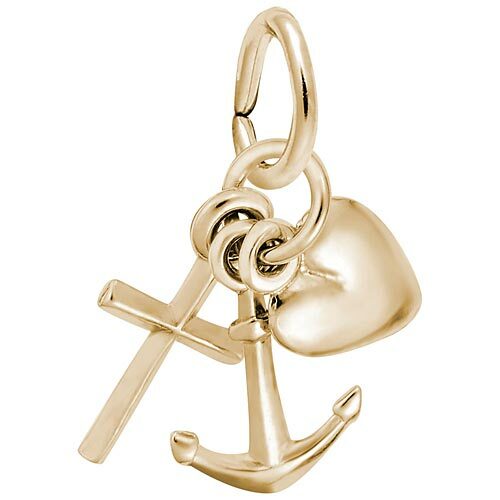 This anchor, heart and cross makes a nice gift. This religious jewelry can be placed on a necklace as a pendant or will be a wonderful addition as a charm for a Charm Bracelet. All Rembrandt Charms are available in either silver or gold.